Posted on Thursday, 30th May: SWM advancing in to Maldives and Comorin Regions. BB-2 crossed land at the W. Bengal coast on Wednesday at depression strength, and on Thursday evening, was at a well marked low strength near Midnapore. BB-2 will now move NW along the trough. Trough is situated from SE Uttar Pradesh running SE into the Bay thru BB-2. The other system, AS-1 , has fizzled out over Oman, and no longer shows any pressure isobars. Weekend day temperatures to rise in Sindh region of Pakistan. Days may touch 48/49c in Dadu, Larkana and Nawabshah. Sukkar and Hyderabad could reach 45c. Karachi wil be around 36c. Fairly heavy rains for Kathmandu on Friday and Saturday. Mumbai: Days will be partly cloudy. Light rain shower possible in some parts of city. Friday and Saturday, sky will be hazy..Rain Amount : 2-4 mms. Cumulus clouds and possible thunder heads in the eastern horizon on Sunday evening. Day temperatures around 34/35c and night will be warm and stuffy at 28/29c. Outer Townships also partly cloudy. Thunder heads developing on Sunday evening…Light rains possible in some parts. Pune will be partly cloudy. Cloudiness increasing on Saturday, with light rain showers in some parts. Thunder shower in some parts of city on Sunday evening. Surat will be partly cloudy. Cloudiness increasing on Saturday. Light rain likely in vicinity on Sunday. Bangalore: Thunder showers in different parts of Bangalore on Friday. Saturday, fairly heavy thunder shower. Sunday, decrease in rains with dim chances of rains. Hyderabad: Heavy thunder showers on week end, specially Sunday. Aurangabad vagaries' forecast appears in Lokmat Times (Aurangabad Edition) on Mondays and Fridays. Shall try to give specific city forecast if required..
Navi Mumbai also received early morning rains. By the way- did monsoon ever reach SriLanka? Since MAY month did not see any clouds, trajectory just hit south India coast rapidly making its way up? It seems Bay side is more prominent - actually WB,Orissa,Bihar,UP are getting rains much ahead SWM date for these areas. sset: Monsoon advancing into Maldives..should also reach Sri Lanka in a day, or with Kerala..
Nice rain in bangalore last evening. Bangalore city recorded 31 mm. In south bangalore it was not heavy rain. But it was light rain, with low clouds zipping from west to east. It went on for about an hour from 9.00 pm. Climate in bangalore for the last 3 days is awesome. Temp around 31. Its cloudy with good breeze blowing in from west. A fake forecast from Indian Meteriological department , which as usual 90% never comes true, are now saying that monsoon will hit kerela a day early . previously they said, it will hit on 3rd June , then 2nd june now 1st june. I tell you they r not forecaster's but jokers, who don't know anything and their forecast is a big flop. Sorry. for the error, the monsoon is now set to enter kerela.without any further changes as predicted by Rajesh sir last forecast. As we speak, Kanyakumari may have been crossed !! Rainfall in INDIA above 10mm ending at 8:30 IST of today. 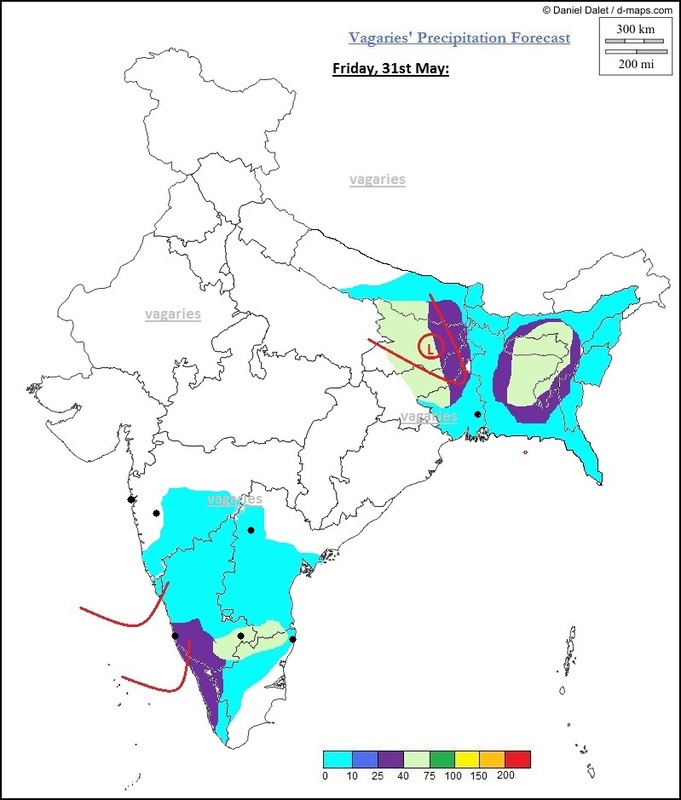 As predicted earlier by Rajesh sir, monsoon will remain sluggish near Mumbai and Konkan coast, but will become very active after 6th June onwards.Mumbai and konkan region will experience downpours only after 6th June onwards. Heavy rain started in south bangalore. Its pouring here in BTM layout. It started 15 min back. Good rainfall reported from Bangalore and Northern regions of Tn, and Kanyakumari. The light green patch in the Friday forecast map covers Bangalore, at shows 40-75 mms. Sam: yes, but Mumbai in the interim period may get a thunder shower around 5th...as the SWM progresses. Pune sporadic showers in South today as Pavan reports. shankar: lovely rains and lovely report...feeling good for Bangalore..vagaries map had shown up to 75 mms..
amit: Nagpur will be partly cloudy, mostly high clouds, and hot till Monday. Day will rise to 44c again.. When do we expect the monsoon in bundelkhand ? Ie khajuraho Jhansi area. . . .? Being a hot zone we look forward to the rains. Please elaborate. Jul:35.8/27.3, Aug:34.5/26.6 , Sep:34/24.8, Oct:33 /19.3 , Nov:28.3 /13.2 , Dec:22.9/08.6 ..
Rajesh sir looking at the current , winds picking up in the Arabian sea in a 'SW DIRECTION' I feel that it's very unlikey that a negative IOD will have its effect on SW monsoon. Abhish/Sam: An IOD effect on our monsoon is still to be established. It is a relatively new find, and the effect of the IOD on SWM is still to be proved after about 15 years of average or so. I do not consider IOD as an important factor for analysing Monsoon rain quantum. rajesh sir thanks for your promt reply,At last the day is getting closer and closer , but sir is it likely that we can get shower on Monday too ? thick dark clounds seen over the eastern sky from thane is it going to rain now....??? Raining in bangalore since 5.10 pm. Low clouds streaming in from west. Great rains here. 3rd continous days rain in bangalore. After friday's terrific deluge , we had some 10 min rain yesterday. Friday bangalore city recorde ~75mm, begur in south subhurb recorded 100 mm. Between 7.30 pm to 8.00 pm begur recoded 66 mm. Your forecast is right sir.Today hyderabad got thundershowers for 1 hour..
THUNDER LIGHTNING AND SHOWERY RAIN IN VASAI. Dombivli got some heavier falls between 7:30-8 and light rainfall is continuing with now increase in intensity,getting steady showers. Sir.how much rainfall got yesterday in kalyan-ulhasnagar belt. @Rajesh This Navi-Mumbai figure (showing more than Panvel) is from which location within the area ? I doubt if there was this much variation between Panvel & Navi-Mumbai. Btw Alibaug got its rains from another blob of clouds !! thunder clouds forming over panvel matheran belt..
Rajesh sir thunderclouds have formed over Mumbai , can be seen clearly from Vasai, is there a storm instored for us tonite. Emkay: Navi Mumbai recording is at Rabale...46.2 mms till Monday morning.